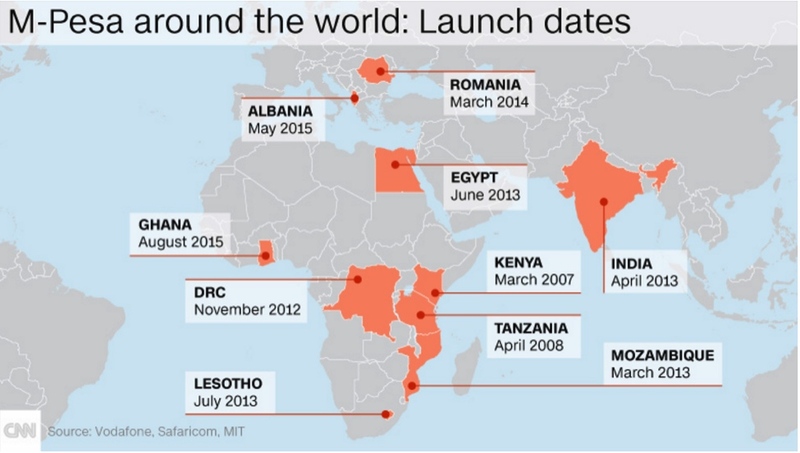 Image credit: CNN, “M-Pesa: Kenya’s mobile money success story turns 10” (2017), http://www.cnn.com/2017/02/21/africa/mpesa-10th-anniversary/. The wide adoption of mobile phones in Africa, along with applications like M-Pesa that it has enabled, has created remarkable technological enthusiasm on the continent. Symbolizing the great potential that lies in technological catch-up and leapfrogging, M-Pesa has served as an inspirational example of what Africa could accomplish in other sectors like energy, education, health, transportation, and agriculture. Indeed, countries such as Rwanda are already using drones to transport medical supplies, while the dramatic drop in the cost of solar energy points to the widespread adoption of the technology across Africa.2 Overall, the mobile revolution has given hope to Africans that they too can be dynamic and innovative players in the global economy, transcending the continent’s current reliance on raw material exports. But while cases such as M-Pesa offer inspiration, the promise of leapfrogging remains largely unfulfilled. The mobile revolution has hardly served as a stimulus for broader industrial development and appears to have had little impact on African innovation policy. Africa still lags behind in manufacturing and has not made major steps to move to the production of technologies related to the mobile industry. Today, African economies are in the middle of their worst downturn in two decades, exposing the persistent dominance of legacy economies. Compounded by the demographic dynamics of rapid population growth and a large youth population with limited skills and employment opportunities, poverty remains the norm in Africa, despite high economic growth rates in some countries. The failure of the mobile revolution to stimulate industrial development in Africa is the result, in part, of a faulty narrative that assumes that Africa can leap into the service economy without first building a manufacturing base. This view ignores the fact that service industries are closely linked to industrial sectors, many of which may be located in other regions of the world. By accepting this popular perception, Africa may be forgoing the opportunity to invest in core infrastructure and engineering capabilities that would enable it to meet the needs of other sectors such as health, education, and agriculture. Infrastructure is both the backbone of the economy and the motherboard of technological innovation.3 African countries need adequate infrastructure to realize their full potential; the continent’s low economic performance and weak integration into the global economy stem partly from inadequate investment in and development of energy, transportation, telecommunications, water and sanitation, and irrigation infrastructures. It is not too late for Africa to become a dynamic and entrepreneurial region driven by innovation. It is certainly right to keep its sights set on technological innovation as an essential driver of economic growth, and as the key to moving beyond the vagaries of commodity exports. But such innovation will depend on industrial development — and the infrastructure and technical capacity it enables — that cannot be leapfrogged. This, in turn, will require a new industrial policy for Africa. The mobile handset in the hands of an ordinary African has become the symbol of leapfrogging. There is some basis for this imagery — the business model that made it possible for Africa to rapidly adopt mobile telephony did involve the availability of low-cost handsets. But it was the establishment of new telecommunications infrastructure — signaled by the spread of mobile phone towers across the continent — that represented on a more fundamental level what the mobile revolution was about.4 The handsets were merely part of the larger and more complex engineering system that made mobile communication, and further industrial diversification, possible. Indeed, creating such a system involved dramatic changes in legislation, higher education, and infrastructure, including reforming laws across Africa to create the entrepreneurial space for new infrastructure,5 founding institutions to train new professionals to work in the mobile sector, and installing fiber optic cables throughout the continent. From a legal standpoint, the policy champions of the disruptive technology faced down the incumbent landlines industry to introduce new business models, including prepayments and the low-cost handsets, that enabled the poor to be included in the revolution. Innovation in higher education came in the form of new telecoms universities in countries such as Egypt, Kenya, and Ghana, and analogous institutions such as the Digital Bridge Institute in Nigeria. 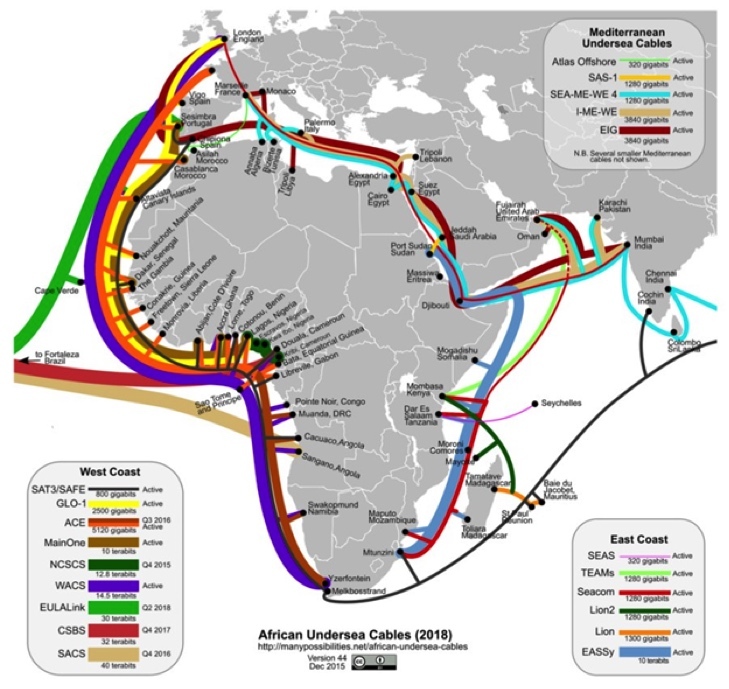 As for infrastructure, while early mobile phone systems were connected to the rest of the world through satellite links, with undersea fiber optic cables available to only a small number of West African cities, today all of continental Africa and Indian Ocean states have access to fiber optic cables with significantly higher bandwidth. Image credit: Steve Song, “African Undersea Cables” (2016), https://manypossibilities.net/african-undersea-cables/. The majority of these countries, however, have not yet leveraged this broadband infrastructure to foster innovation or development, an indication of the lack of complementary evolution in innovation policy.6 In some cases, telecoms operators have yet to migrate from satellite links to fiber optics cables, leaving the promise of low communication costs out of reach. Even where migration has occurred, access charges remain prohibitive. The mobile revolution did in fact offer Africa a unique opportunity to catalyze industrial development and diversification, but that opportunity has not been seized, in large part due to the mistaken view that the introduction of mobile phones and extension of telecommunications services across the continent would allow Africa to leapfrog industrialization rather than build out a new industrial base. This, in the end, defined the continent as a source of consumers rather than producers of technologies. The failure of the mobile revolution is that it has not succeeded in establishing an infrastructural base for economic development, nor for deploying adjacent emerging technologies. Until this lesson is learned from an innovation policy standpoint, the popular call for technological leapfrogging will amount to too little. Infrastructure projects are inherently technological in nature — they represent bundles of scientific and technical knowledge that are embodied in both equipment and human capabilities. Talk of infrastructure projects may tend to focus on rates of return on investment, impact on public finances, formation of public-private partnerships, identification of sources of funding, or environmental and social costs, but what is often overlooked is the role of infrastructure as the foundation for innovation and economic transformation. In addition to facilitating economic activities and generating employment, infrastructure projects are reservoirs for engineering capabilities. The development of geothermal energy in Kenya, for example, has resulted in the creation of a large pool of experts working locally and abroad. These types of infrastructure projects offer Africa a unique opportunity to build the necessary engineering and managerial capabilities for the design, construction, and maintenance of future projects. These projects can then be used as a basis for designing new engineering courses and research activities; in South Korea, for instance, developing the high-speed rail led to the creation of the Korean Railroad Research Institute in 1996. Policymakers must recognize the potential to tap this knowledge to benefit the wider economy. Ironically, this vision existed in much of colonial Africa. When the British built the Kenya–Uganda rail in the late 19th century, they included a technical facility for repair and maintenance. Over the years, however, African infrastructure projects have increasingly been delinked from technological training and are underperforming as a result. Unfortunately, the design of such projects in Africa tends to focus most on awarding contracts to the lowest bidder, not on seeking to maximize technological capacity. Infrastructure is both the backbone of the economy and the motherboard of technological innovation. To industrialize, Africa will need a large pool of appropriately trained engineers — some foreign, but most local — to help with the design, construction, and maintenance of infrastructure. It is routine maintenance and additional construction that will require significant and timely creation of local capacity, including entrepreneurs who can identify business opportunities associated with new infrastructure projects that will contribute to sustained economic growth and the spread of prosperity. This will in turn involve considerable accumulation of knowledge and capabilities. There are, however, strategic measures that such countries can take to ramp up their capacity. At bottom, they begin with the recognition of innovation as the most important driver of long-term economic transformation, and of infrastructure as the foundation for innovation. They will also depend on the understanding that the key objective of infrastructure projects should extend beyond the provision of services, to the acquisition, domestication, and local diffusion of technological capacities. While leapfrogging gets most of the attention, African policy makers continue to pursue a rather more old-fashioned approach to industrial development: adding value to the natural resources and raw materials that define Africa’s legacy economies. The African Union’s ten-year Science, Technology and Innovation Strategy for Africa 2024 has attempted to reposition the continent as a technology-driven economy, with an important focus on leveraging emerging and available technologies to generate products and services that are relevant to local economies. But adding value to resource-centered exports remains the continent’s primary strategy for economic growth. Value addition appeals for a number of reasons; at present, the continent’s commodity systems earn producers negligible profits. Africa produces nearly 75 percent of the world’s cocoa but gets only about 2 percent of the $100 billion global chocolate market. In 2014, Africa exported $2.4 billion of coffee, while Germany, which is not a producer but a processor of this commodity, re-exported nearly $3.8 billion worth of coffee worldwide. The standard response to this disparity is to call on Africa to add value to its commodities itself. To make value addition the primary model for industrial diversification, however, would be a mistake. The common misunderstanding that industrialized countries advanced largely because they exploited low-cost natural resources from their African colonies leads many in Africa to believe that they too can industrialize and grow by making better use of their natural resources. But to do so would be to ignore important lessons from economic history. In general, there is little evidence to suggest that countries industrialize by adding value to their raw materials. Rather, the causality runs the other way — countries add value to raw materials because they already have local industries with the capacity to turn raw materials into products. Initial industrial development thus becomes the driver of demand for raw material and value addition rather than the other way around.9 Countries such as the United States, Canada, and Australia experienced commodity booms not because they added value to raw material but because they possessed nascent industries that required raw material. As a result, they designed policy instruments for resource exploration, improved prospecting technologies, and invested in commodity-based research,10 and it was these innovation-oriented measures that then resulted in value addition. Africa’s traditional focus on raw minerals rather than innovation has caused it to lag far behind in such efforts. Such joint ventures can benefit Africa if they are guided by efforts to build local capabilities, mostly through linkages with universities as well as domestic suppliers of parts. Without such measures, however, joint ventures serve only as vehicles for the transfer of revenue to home firms with minimal benefit to African countries. Fortunately, African nations do have the benefit of being latecomers — the world is full of useful examples of economic diversification that they can follow. In fact, many countries that have recently transitioned to learning economies started off with significantly fewer resources (in terms of finance and research facilities) than the majority of African countries have today. Take the case of Taiwan: in the early 1960s, the country was a world leader in mushroom exports, a high-volume, low-value, perishable export commodity that greatly limited its prospects of industrial learning. Acquiring the ability to create new technological combinations is the key to industrial development. It was only when Taiwan transformed itself into a learning economy that it was able to emerge as a modern semiconductor powerhouse. Taiwan viewed the emergence of semiconductors as a basis for industrial development, not simply the provision of services, and as a result pursued technology partnerships with the United States that involved training Taiwanese youth.12 Taiwan also combined four local research institutes left behind by the Japanese occupiers into the world-class Industrial Technology Research Institute (ITRI), which played a critical role in this transition, spawning many of the country’s leading semiconductor firms. Importantly, the institute was founded not for the purpose of adding value to exports but instead as an explicit focal point of Taiwan’s policy decision to reinvent itself as a learning economy. Instead of leveraging raw materials for value addition, Taiwan leveraged an existing technology for economic diversification and technological learning, prioritizing an initial use of that technology that could be readily combined with other platforms to generate increasingly diverse products. As economist Ricardo Hausmann has argued, industrial growth proceeds like a game of Scrabble: nations start off with minimum technological capabilities that they recombine to create more technologies in the same way that letters are used to create new words in a Scrabble game.13 Not all letters are created equal. Some have higher values, like J, Q, X, and Z, but they are difficult to use, and players often have to substitute more versatile letters to create new words. Similarly, some technological capabilities generate more combinations than others. Semiconductor and chemical industries are examples of generic technologies that do so. The attraction of adding value to an economy’s material endowments is that it is a strategy to leverage high-value letters, valuable raw materials, into words that bring high scores. But as with Scrabble, focusing on producing words that utilize the letter Q or X greatly limits the number of words that the player can use and forgoes acquiring technological capabilities that have higher recombinant value. Focusing technological learning around natural resource endowments actually limits the field of play for acquiring new capabilities and platforms. Taiwan didn’t concentrate its efforts on semiconductors because it was well endowed with sand or silicon; it did so because semiconductors at that time represented a nascent technological platform with endless possibilities for recombination. A large part of this investment will come from overseas, as evidenced by China’s investment in African infrastructure projects, mainly in transport. The recent creation of the China-led Asian Infrastructure Investment Bank (AIIB) will strengthen the country’s role as a source of funding not only for Africa but also for many other regions of the world, including industrialized countries. From a governance standpoint, African countries and cities will need to capitalize on the critical role that infrastructure plays in entrepreneurship and development. The most inspirational opportunity today lies in making broadband — the low-hanging fruit of the mobile revolution — more accessible and affordable to young entrepreneurs.16 Indeed, cities in Kenya, Nigeria, Rwanda, and South Africa have begun to experiment with such a priority, providing free Wi-Fi to stimulate entrepreneurial activities.17 Generally speaking, urban centers house the highest concentration of infrastructure facilities and, as such, will continue to lead the way as the most creative and dynamic regions. Cities such as Lagos, Nairobi, Accra, Pretoria, and Cairo set inspiring examples of regions maximizing infrastructure and policy for innovation and development. Leapfrogging industrial development is not an option. While there has been great optimism over the emergence of information and technology hubs in major urban areas across Africa,18 many of which feature young entrepreneurs producing new technologies designed to solve Africa’s problems, their distance from centers of research and learning signals the need to foster more integrated innovation ecosystems that bring together business, academia, and government. Significant measures will need to be adopted to expand engineering training. This might include upgrading training institutes to offer certified engineering training, strengthening engineering training within private and public enterprises, and forging stronger international education partnerships. Doing so will also require greater overall funding and policy support for technology-based ventures. Specific engineering education objectives should also be integrated into major infrastructure projects themselves, as was the case with the expansion of telecoms infrastructure and the creation of new technology universities in Egypt, Ghana, and Kenya. As armed forces form one of the most important sources of engineering capacity, carefully designing programs to repurpose sections of the military to support infrastructure construction can also help to foster local capacity. All such investments pay off in the long run through reductions in maintenance costs. The mobile revolution, along with other emerging technologies like 3-D printing, drones, and solar energy, offers important starting points for innovation along such paths. Many of the key elements for such a process are emerging in Africa; Egypt, Kenya, and Ghana, for example, have set up new universities to train professionals for the mobile sector on the initiative of telecoms authorities rather than education ministries. Ethiopia has also begun local assembly of mobile handsets with the intent of moving up the value chain by incrementally producing components locally. But leapfrogging industrial development is not an option; if anything, the evolution of the mobile sector demonstrates the continued importance of industrial development as the source and catalyst for innovation and economic growth. It also offers important lessons for how government, industry, and academia can collaborate to create new industries, expand manufacturing, create jobs, and stimulate the structural transformation of African economies. The term “industrial policy” may continue to invoke the ideological debates of the last century, where it denoted subsidies to infant industries, direct state intervention, and government selection of industrial sectors. New approaches will need to be pursued, as outlined above, to ensure that the past failures of industrial policies are not repeated. Moving Africa from its current focus on raw material exports, value addition, and consuming technology to becoming a learning economy and technology producer, will require 21st-century industrial policy that supports continuous interactions among government, industry, and academia in open competitive and collaborative innovation ecosystems. Leapfrogging particular technologies, such as landlines, may in some cases be an option. But industrialization itself, and the innovation and development it generates, cannot be skipped over. 1. See Harford, T. “Money via mobile: The M-Pesa revolution.” BBC (February 13, 2017), http://www.bbc.com/news/business-38667475; and Monks, K. “M-Pesa: Kenya’s mobile money success story turns 10,” CNN (February 24, 2017), http://www.cnn.com/2017/02/21/africa/mpesa-10th-anniversary/. 2. Amankwah-Amoahm, J. 2014. “Solar Energy in Sub-Saharan Africa: The Challenges and Opportunities of Technological Leapfrogging.” Thunderbird International Business Review 49.1: 15–31. 3. See Juma, C. “Infrastructure for Innovation.” New African (June 26, 2015), http://newafricanmagazine.com/infrastructure-for-innovation/. 4. Batuo, M. E. 2015. “The Role of Telecommunications Infrastructure in the Regional Economic Growth of Africa.” Journal of Developing Areas 49.1: 313–330. 5. Ndemo, B. 2016. “Inside a Policymaker’s Mind: An Entrepreneurial Approach to Policy Development and Implementation.” In Ndemo, B. and T. Weiss, eds. Digital Kenya: An Entrepreneurial Revolution in the Making. London: Palgrave Macmillan, 239–267. 6. Juma, C., and Y. C. Lee. 2005. Innovation: Applying Knowledge in Development. London: Earthscan, London, 78–87. 7. Juma, C. 2011. “Africa’s New Engine.” Finance and Development 48.4: 6–11. 8. See Juma, C. 2015. The New Harvest: Agricultural Innovation in Africa. Rev. ed. New York: Oxford University Press. http://belfercenter.ksg.harvard.edu/publication/25699/new_harvest.html. 9. Ville, S., and O. Wicken. 2013. “The Dynamics of Resource-Based Economic Development: Evidence from Australia and Norway.” Industrial and Corporate Change 22.5: 1341–1371. 10. David, P. A., and G. Wright. 1997. “Increasing Returns and the Genesis of American Resource Abundance.” Industrial and Corporate Change 6.2: 203–245. 11. Nam, K. M. 2011. “Learning through the International Joint Venture: Lessons from the Experience of China’s Automotive Sector.” Industrial and Corporate Change 20.3: 855–907. 12. Hung, C. Y., et al. 2006. “Global Industrial Migration: The Case of the Integrated Circuit Industry.” International Journal of Technology and Globalisation 2.3–4: 362–376. 13. Hausmann, R. “Secrets of Economic Growth.” World Economic Forum (March 10, 2015), https://www.youtube.com/watch?v=2FeugaLv5Bo. 14. Juma, C. 2014. “Complexity, Innovation, and Development: Schumpeter Revisited.” Journal of Policy and Complex Systems 1.1: 4–21. 15. African Development Bank. “Infrastructure Finance.” https://www.afdb.org/en/topics-and-sectors/sectors/private-sector/areas-of-focus/infrastructure-finance/. 16. See Song, S. “African Undersea Cables.” Updated June 2016, https://manypossibilities.net/african-undersea-cables/. 17. See “10 African cities with free Wi-Fi.” IT News Africa (April 22, 2014), http://www.itnewsafrica.com/2014/04/10-african-centres-with-free-wi-fi/. 18. Adesina, O., et al., eds. 2016. Innovation Africa: Emerging Hubs of Excellence. Bingley, UK: Emerald Group Publishing. 19. Mangeni, F., and C. Juma. Forthcoming. Emergent Africa: Evolution of Regional Economic Integration. Cambridge, UK: Cambridge University Press.